A veteran dragoon who rose to command the Department of New Mexico during the Civil War. It was the approach of Carleton's California Column in September 1862 that finally caused Confederate General H.H. Sibley to abandon all thoughts of taking New Mexico and, in turn, to quit El Paso and march his brigade eastward. After serving as a volunteer in the Aroostook War in his native Maine, Carleton received a commission in the Regular Army in 1839. He served under Brigadier General Stephen W. Kearney on the Rocky Mountain Expedition of 1846, then joined the staff of General John Wool on the latter's march into Mexico. He was brevetted for gallantry in the Mexican War and thereafter served on surveying, exploring and Indian fighting expeditions. From 1851 to 1856 he served in New Mexico with the First Dragoons. After duty in the East he was back in 1859 at Fort Tejon, California, with the 1st Dragoons. The outbreak of the Civil War found him a major in the newly formed 6th U.S. Cavalry. General George Wright, responding to a plea from Canby in New Mexico, ordered Carleton to raise a relief force. The latter raised the 1st California Infantry and the 1st California Cavalry as the nucleus of the relief force and was appointed Colonel, 1st California Volunteer Infantry. He moved his force eastward almost at once. 'A remarkable march through the hostile Indian country of Arizona to join Canby made by eleven companies of infantry, two of cavalry, and two batteries under Colonel J. H. Carleton...overland from Southern California," we are informed by the editors of Battles and Leaders of the Civil War (Vol. II, p. 698). At the Battle of Adobe Wells, Carson found himself besieged by a large party of Kiowas and Comanches. The outnumbered Carson kept the Indians at bay with his howitzers and successfully withdrew that night after first burning the Kiowa village. As the Civil War ended in the East, the volunteer regiments continued in action until relieved by the Regulars in late 1866. Carleton was promoted to Major General, USV, and brevetted Major General, U.S. Army. With the postwar reduction of the Army, Carleton was appointed Lieuteant Colonel of the 4th U.S. Cavalry. He wrote numerous articles for military publications and published a book on the Battle of Buena Vista. He died in uniform at age 59 in 1873. It should be noted that although he was strong on discipline, General Carleton was popular with his men, a careful writer and tactician who impressed both Jefferson Davis and George McClellan, and a faithful and beloved husband and father. The quotations are from Robert M. Utley, Fort Union National Monument, National Park Handbook Series No. 35, Washington DC 1962. p. 37. Robert U. Johnson and Clarence C. Buel, editors Battles and Leaders of the Civil War, 4 volumes NY 1887, 1956 edition, Vol. II. Mark M. Boatner III, Civil War Dictionary. NY 1959. Aurora Hunt, Maj. Gen. James H. Carleton (1814-73), Western Frontier Dragoon, Glendale, CA 1958. Hubert Howe Bancroft, History of California, 7 vols., Vol. vii, SF 1890. Francis B. Heitman, Historical Record, 2 vols., Washington DC 1903. James Henry Carleton was born at Lubec, Maine, on December 27, 1814. He was the son of John and Abigail (Phelps) Carleton. His father John was a ship captain. At age twenty-five he was commissioned a lieutenant in the Maine militia in 1838 and participated in the boundary dispute with Canada known as the "Aristook War." He received appointment as a second lieutenant in the First Dragoons on October 18, 1839, and then trained at Carlisle Barracks. In October 1840 he married Henrietta Tracy Loring of Boston. Henrietta accompanied Carleton to his duty assignment at Fort Gibson, Indian Territory, where she died in October 1841. Later in the 1840s Carleton served as assistant commissary of subsistence at Fort Leavenworth, accompanied Maj. Clifton Wharton's expedition to the Pawnee Villages in Nebraska, served as an officer on Col. Stephen Watts Kearny's 1845 expedition to South Pass, and saw action in 1847 in the battle of Buena Vista. In 1848 Carleton married Sophia Garland Wolfe, niece of Gen. John Garland. During the 1850s Carleton served under Garland in New Mexico Territory. Summer of 1858 saw him, his family and 700 raw recruits stationed at Fort Tejon, California as commander of the Fort with the First Dragoons. In 1859 he was ordered to Salt Lake City to investigate the massacre at Mountain Meadows in 1857 of 120 Arkansas emigrants. He concluded that it was Mormons dressed as Indians and 20 years later a court convicted one and he was executed at the spot of the crime. At the outbreak of the Civil War, Carleton was appointed to Colonel of 1st Infantry, California Volunteers on 26 July 1861 by then Governor John L. Downey. 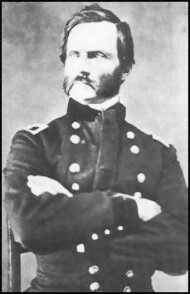 He would ultimately become brigadier general of the California volunteers and command the "California Column" on its march to the Rio Grande. This journey consisted of around 2350 men and was done largely on foot, in summer, wearing wool uniforms, and carrying heavy rifles & knapsacks. In a very hot and dry environment, amazingly not one man was lost due to non-battle causes. The hike from Wilmington, CA to El Paso, TX has been reported to be the longest infantry march in US Infantry history. Carleton was basically in command in Southern California from January of 1861 to April of 1861. In September 1862 he replaced Gen. Edward R. S. Canby as commander of the Department of New Mexico. One of Carleton's first acts upon assuming command was to reissue Canby's order establishing martial law in New Mexico. He also devised a passport system to distinguish loyal citizens from Confederate spies. Although Carleton never attempted to set himself up as a military governor, he believed he had authority to carry through any policy he deemed essential to the peace and prosperity of the territory. Many of his actions antagonized the citizens. In addition to securing the territory against Confederate intrigue, Carleton took steps to subdue hostile Indian tribes. He sent Col. Kit (Christopher) Carson and other subordinates against the Mescalero Apaches with orders to kill all Indian men "whenever and wherever you can find them." By February 1863 the Mescaleros had been relocated on the new Indian reservation of Bosque Redondo on the Pecos River. Carleton then waged war against the Navajos, ordering Carson and other officers to destroy all crops in Navajo country to starve them into submission. Carleton's strategy brought immediate results. Some 8,000 Navajos surrendered and then made the "Long Walk" to Bosque Redondo, where Carleton planned to turn them into Christian farmers. The Bosque Redondo experiment ended in failure, however. The Mescaleros quietly fled the reservation, and the Navajo captives faced death, disease, and a constant shortage of food. The cost of maintaining Bosque Redondo persuaded the government to allow the Navajos to return to their homeland. Carleton's policies became ensnarled in territorial politics. Although his superiors believed him an efficient and capable officer, hostile criticism led to his reassignment early in 1867. After a long overdue furlough he returned to duty in 1868 with his regiment, the Fourth United States Cavalry in Texas. He served with his regiment until summer of 1872. He was granted six months medical leave in a "cold climate" for chronic excema problems with his legs. He returned to duty in December of 1872 probably by ship. He was hospitalized with bronchitis contracted enroute. He never fully recovered and left New Orleans for San Antonio in the cold rainy season. After arriving on December 28th he contracted pneumonia the next day. He was hospitalized the next day and died in San Antonio on January 7, 1873. Carleton and his second wife, Sophia, had five children; two died in childhood. Carleton published several accounts of his military experiences. His oldest son, Henry Guy Carleton, became a journalist, playwright, and inventor. What Kind of a Man Was James Henry Carleton? He lived fifty-eight adventure filled years and we know what he did in those years. As a human being he is hard to pin a label on because he was a very different man at different times. He was sensitive, literate, emotional, and creative; a patriot through and through; capable and dedicated military man who sometimes used what seems toe be and excess of disciplinary zeal; a good husband and father who had to neglect his family when duty called; a compassionate peace keeper with his Indian charges when conditions permitted but an implacable foe when he had to be. There were reports that in the end he turned to the "bottle" in the twilight of his career. It was mentioned in some reports, but moderate drinking was very common on the frontier to combat loneliness and boredom. So without actually being there we will never know. He was never the less a good soldier and great leader at a time when he was desperately needed. Aurora Hunt, Major General James H. Carlton, 1814-1873: Western Frontier Dragoon (Glendale, California: Clark, 1958). Paul Andrew Hutton, ed., Soldiers West: Biographies from the Military Frontier (Lincoln: University of Nebraska Press, 1987). William A. Keleher, Turmoil in New Mexico (Santa Fe: Rydal Press, 1952).